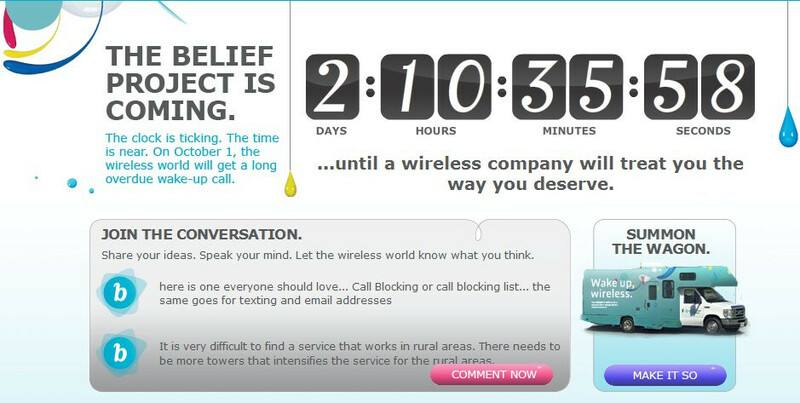 Something is surely brewing over at US Cellular when a countdown clock is ticking down the time when “The Belief Project” is expected to be unveiled to the world. This new marketing campaign will undoubtedly raise some eyes from consumers all around with their quick hints of something big happening that's expected to shakeup the wireless game here in the US. It looks like we're all just waiting “until a wireless company will treat you the way you deserve.” Although there are many speculations as to what the regional carrier will be dishing up in a couple of days, it doesn't hurt to come up with some ideas as to what “The Belief Project” is all about. Maybe we'll see something really compelling in regards to contract-free plans? Or maybe we'll see a complete revolution that'll take us all by surprise? Whatever it is, we don't have to wait long for this one thankfully – but let's just hope it'll be enough to get the big four to take notice. Actually US Cellular is a very good company while you're in Chicago. I am very familiar with them and I have to say I was happy when I had their service. Granted I have VZW due to work (and to save money) but I would have never left them. First to provide service in Chicago Subways, at ballparks (Wrigley, US Cell Field and Soldier Field), and their service is far from sucking. Well I certainly hope US Cellular would provide service at US Cellular Field. Cell service providers and manufacturers really need to come down off of cloud 9. This new niche is "revolution" advertising that was unique with the iPhone and successfully done ONCE with VZW and the first Droid is really getting old and predictable. I don't stay awake at night in anticipation of what is next.